The Borobudur Temple Compounds is one of the greatest Buddhist monuments in the world and was built in the 8th and 9th centuries AD during the reign of the Syailendra Dynasty. The monument is located in the Kedu Valley, in the southern part of Central Java, at the center of the island of Java, Indonesia. The main temple is a stupa built in three tiers around a hill which were a natural center: a pyramidal base with five concentric square terraces, the trunk of a cone with three circular platforms and, at the top, a monumental stupa. The walls and balustrades are decorated with fine low reliefs, covering a total surface area of 2,520 m2. Around the circular platforms are 72 openwork stupas, each containing a statue of the Buddha. The Borobudur Temple Compounds consists of three monuments: namely the Borobudur Temple and two smaller temples situated to the east on a straight axis to Borobudur. The two temples are Mendut Temple, whose depiction of Buddha is represented by a formidable monolith accompanied by two Bodhisattvas, and Pawon Temple, a smaller temple whose inner space does not reveal which deity might have been the object of worship. Those three monuments represent phases in the attainment of Nirvana. 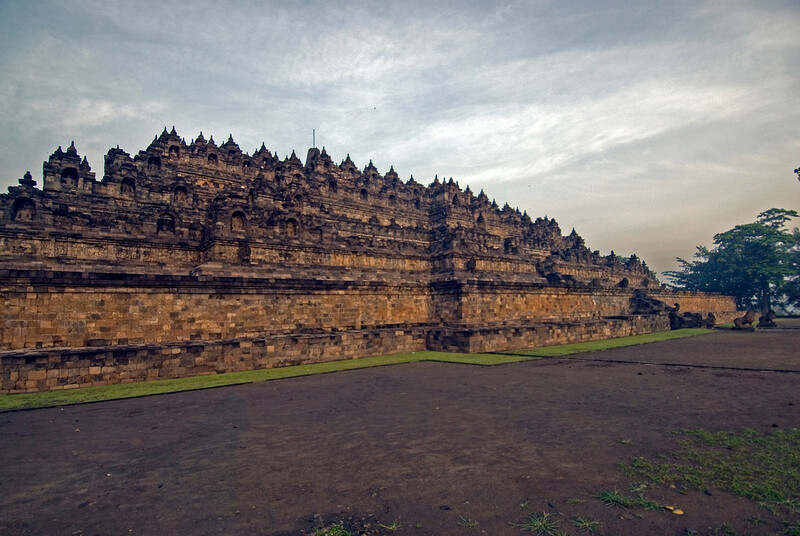 The Borobudur Temple Compounds are one of the top cultural attractions in South East Asia. The temple is the largest single Buddhist temple in the world. Lost to most of the world for several hundred years, it was buried by volcanic ash and jungle until the early 20th Century. 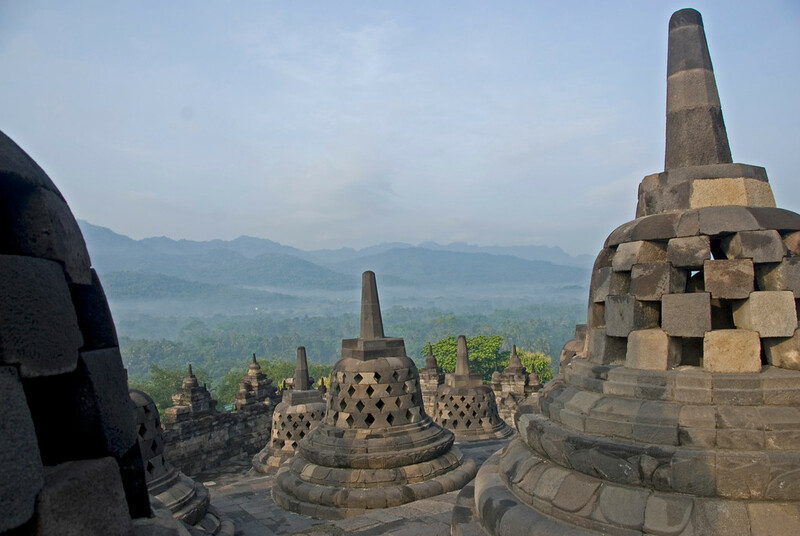 In the last several decades, the Indonesian government has made restoration of Borobudur a top cultural priority. Borobudur is an easy drive from Yogjakarta and it can easily be visited in a morning or afternoon or visited in conjunction with nearby Prambanan. During my visit to Borobudur, I had the pleasure of meeting an Indonesian English class which was visiting to practice their English with tourists. Everyone was interested in Barak Obama, who had spent a few years in Indonesia. If you visit Bali, a side trip to Yogyakarta is well worth the time. 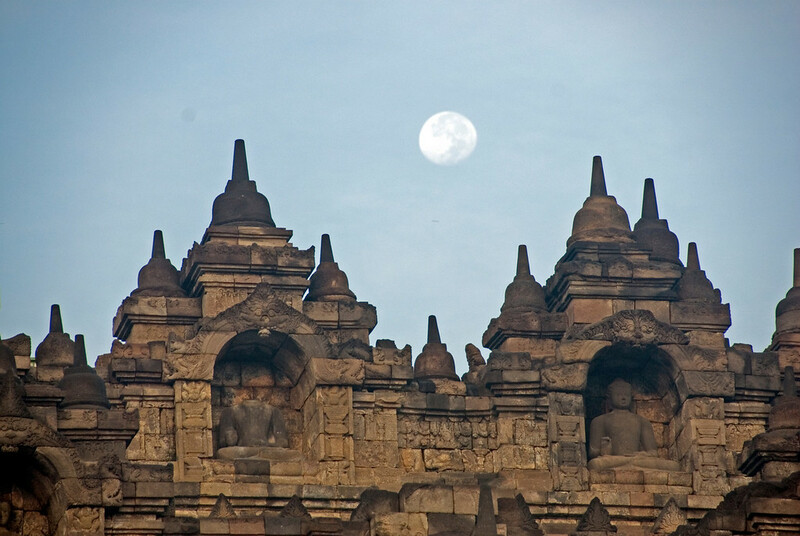 The Borobodur Temple Compounds is a 9th century Buddhist temple complex. The structures are built on a hill using several different levels of land. 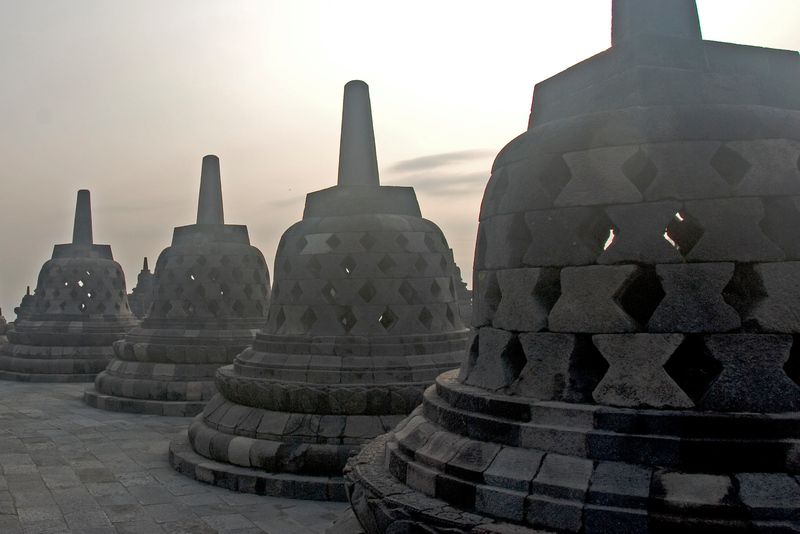 From afar, the Borobodur looks like a single large stupa. But when viewed from above, it looks like a giant tantric Buddhist mandala. Hence, the design of the temple masterfully combines the principles of Buddhist cosmology and that of nature. The temple was rediscovered in the 19th century and underwent restoration in the 20th century. In fact, UNESCO funded the major renovation process for the temple compound in 1973. There are two other smaller temples that are encompassed within this heritage area: Pawan and Mendut Temples. Both temples are Buddhist temples. This temple compound is located in Central Java, Indonesia. It was inscribed into the UNESCO World Heritage Sites list in 1991. The site of the temple is between two twin volcanoes and two rivers. Hence, it is considered a ‘sacred place’ by the Javanese. There are also two museums located on the site of the temple compound. These are Samudra Raksa Museum and Karmawibhangga Museum. The Borobodur Temple in Indonesia is the world’s largest Buddhist temple. The temple is open from 6 AM to 5 PM. However, you need to book a sunrise tour of the temple to be able to visit as early as 6 AM. If you are a walk-in tourist, you are allowed access only from 8AM onwards. There are several ways to travel to Borobodur Temple Compounds in Central Java, Indonesia. The most common jump off point is in Yogyakarta, which is approximately an hour’s drive away. You can hire a car or take the public bus to get to the temples. If you are traveling from Jakarta, you need to ride the train to Purwokerto. From there, you must take a connecting bus to Wonosobo that will take you to Borobodur. If you are traveling from Surabaya, you can take a train or bus to Yogyakarta. From Yogyakarta, you can hire a car to drive you to Borobodur. Bonus Tip: You should visit during sunrise or sunset since you can get the best views (and photos!) of the temple. Also, you should avoid visiting on weekends to avoid the crowd. Since it was restored, the Borobudur Temple Compounds has been named as one of the UNESCO World Heritage Sites in Indonesia in 1991. Since then, it has become a major tourist destination in the country. The temple consists of over 2,600 relief panels and more than 500 statues of Buddha. There also detailed wall carvings all throughout the temples. There are six square platforms that make up the Borobudur Temple Compounds. Each square platform is topped by three circular platforms. At the center of the top platform is the main dome; it is surrounded by 72 Buddha statues. The wall reliefs recount the life of Buddha by depicting his journey towards finding the ultimate truth. Hi Gary……wonder whether u visited the Dieng Plateau in Jogjakarta? I was at Borobodur about 20 years ago. A real historical treasure. They have Buddha statues in them bells too! Beats me to knowing what is the idea behind it. Happy week to you, Gary.